Contains 248 pages and a lot of interesting colour photographs. Salamanders and newts can make for extremely endearing and interesting terrarium animals. In this generously illustrated and practically-orientated guidebook, a team of experienced keepers and breeders describes in detail the basics of successful keeping and breeding your tailed amphibians. 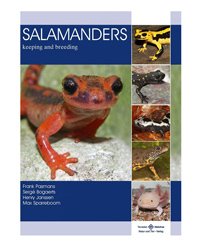 In more than 60 species accounts of newts, salamanders and even caecilians, the authors discuss individual particulars and point out what you must be aware of.